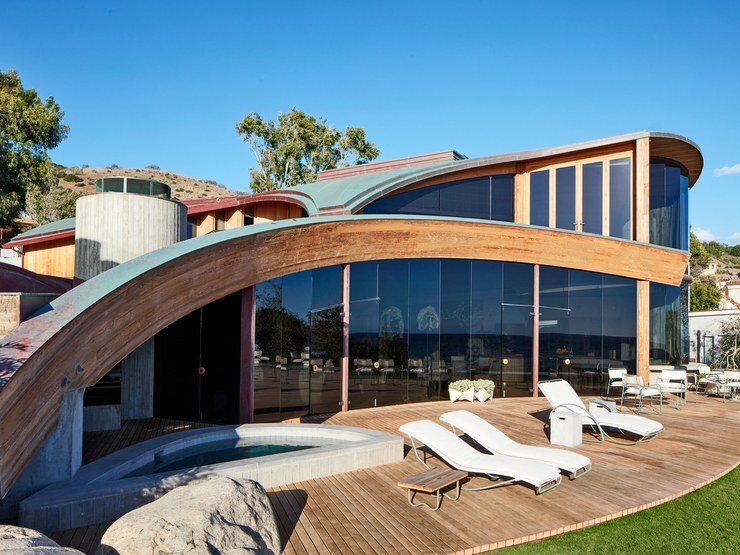 Every aspect of the revived John Lautner‘s Carbon Beach House, is simply breathtaking. 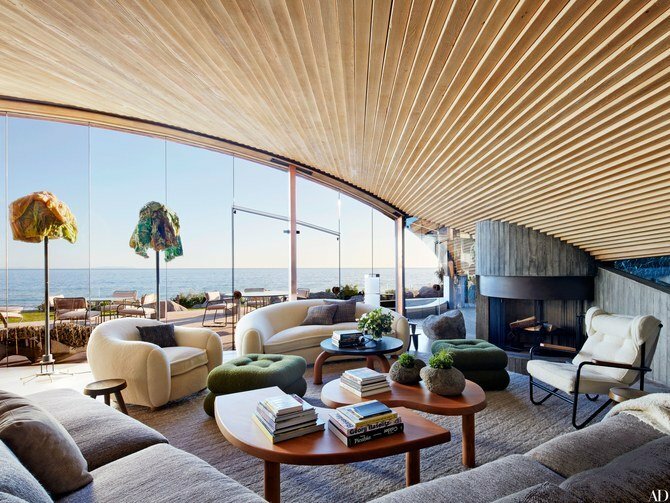 Implanted in Malibu, California, interior designer Waldo Fernandez and architect Michael Kovac partnered up on refurbishing Jamie McCourt’s classic 1980 John Lautner beach getaway. McCourt purchased the 7,000 square foot residence in 2006 from Courtney Cox and David Arquette. 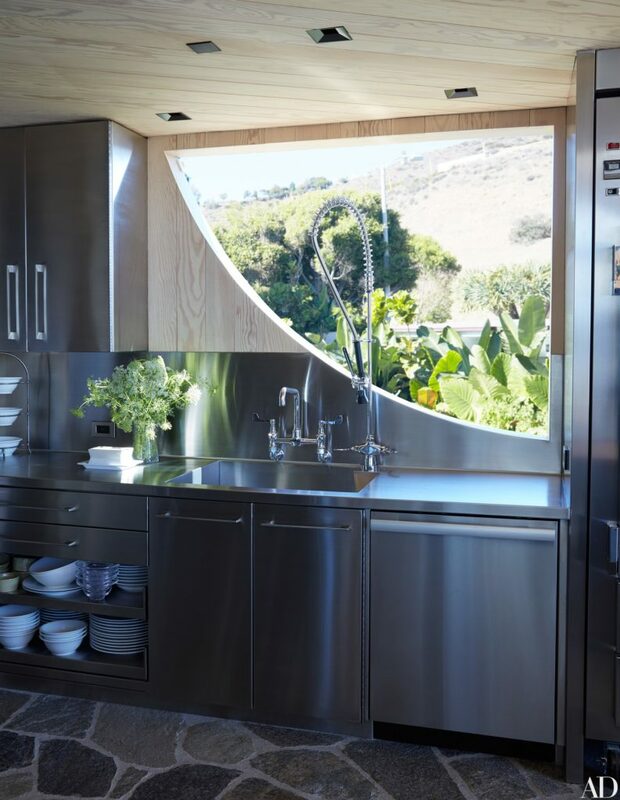 “The minute I walked in, it felt right,” the client stated in an interview with Architectural Digest. An avid swimmer, McCourt felt the house was lacking in swimming facilities and wished for an additional indoor swimming pool. 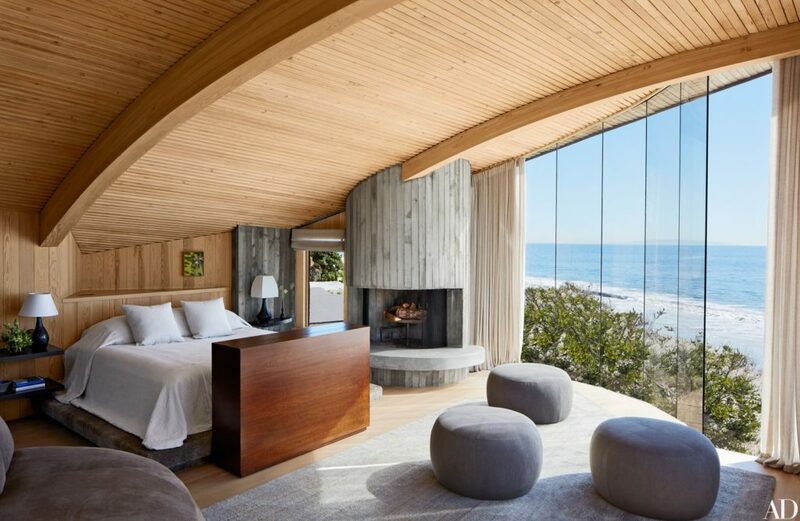 From that desire began an interior remodeling project, with the intention to preserve the spirit of the original John Lautner creation. 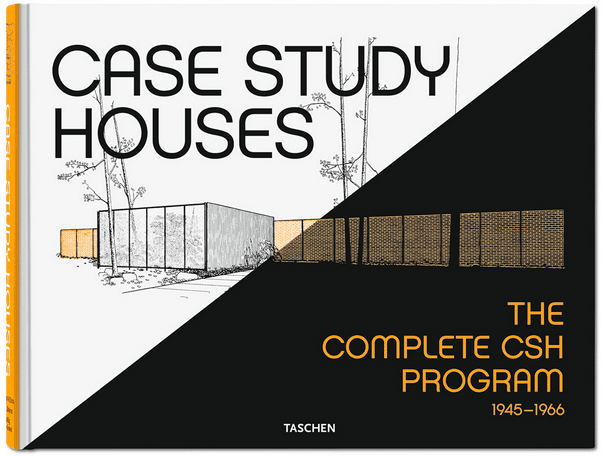 The first step was to remove a two-story bedroom, which was added to the house somewhere in the 90s. 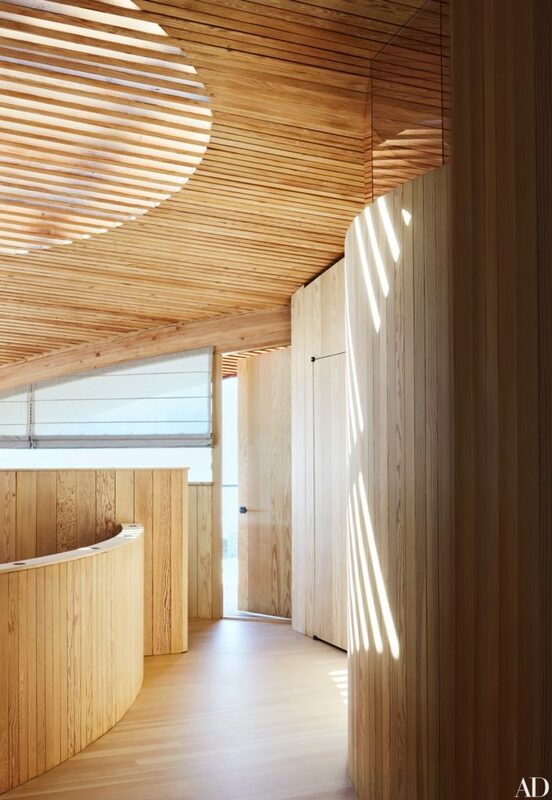 Now, a 25-meter indoor lap pool occupies the space, reverberating the original forms and materials of the contemporary house. Large windows adjacent to the pool allow natural light to flow in. 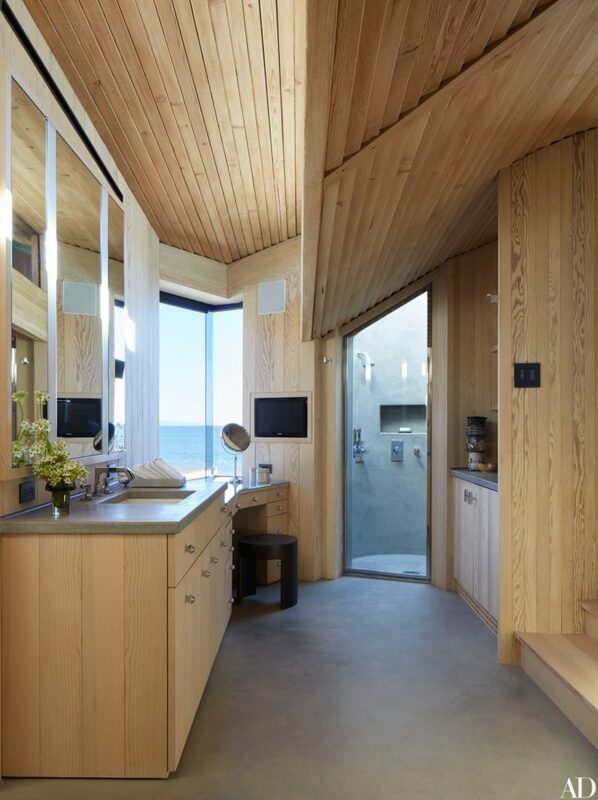 Additionally, a large open window at the far end breathes in the fresh ocean air. It is not the only interior space that acts in accordance with the exterior – Charlotte Perriand cocktail tables, Oscar Niemeye ottomans and a matching vintage sofa plus club chair by Jean Royère fabricate a stylish retro vibe in the living room, complementing the outdoor patios vintage furniture. 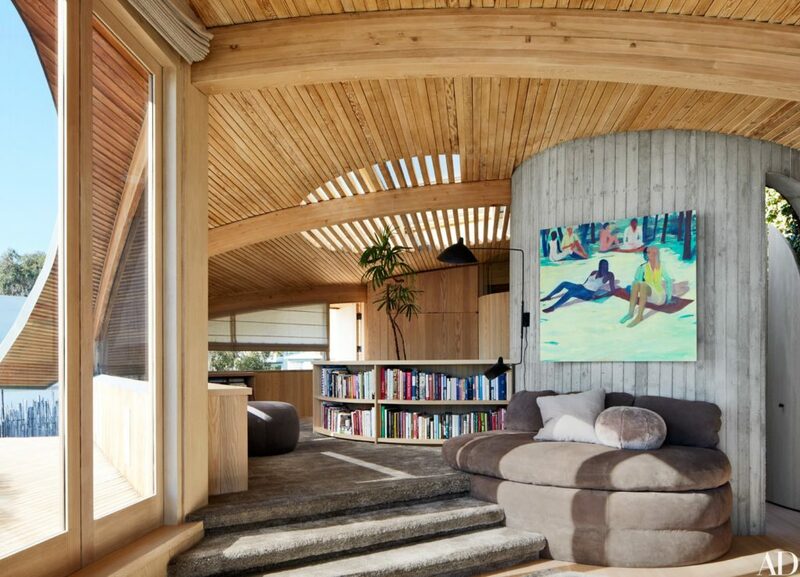 A gorgeous fireplace blends in with the dark wood paneled wall in the corner, mimicking the shape of the spherical midcentury modern home exterior. 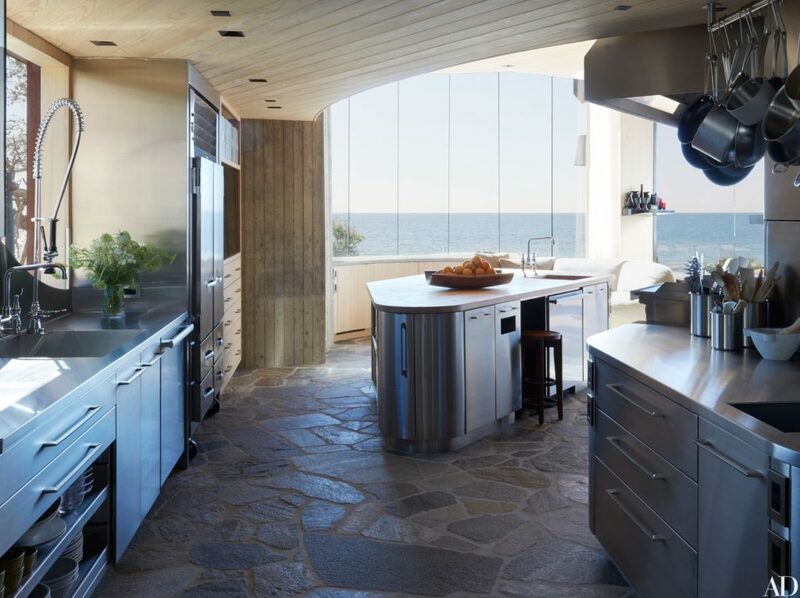 The immense wall to ceiling windows grant a view of the ocean, opening up full scale across from the homes patio and backyard. 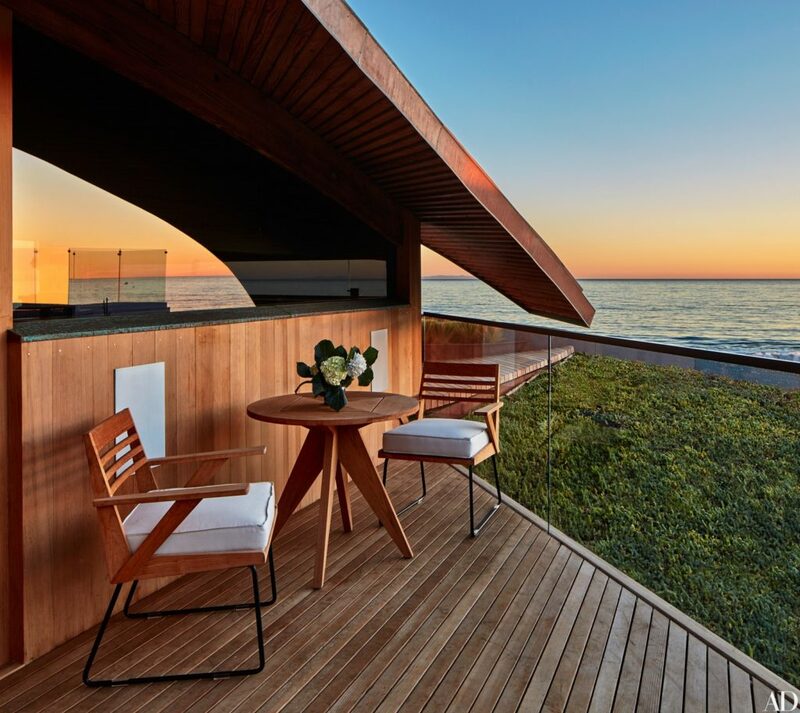 On the second level, yet another patio grants a breathtaking view of the ocean and its skyline far ahead. The smaller terrace is an extension of the master bedroom, made comfortable for leisurely use by a custom-made teak table and chairs by Alwy Visschedyk for Summit with the added comfort of cushions by Holly Hunt fabric. A second, curved fireplace is found in the corner of the master bedroom. 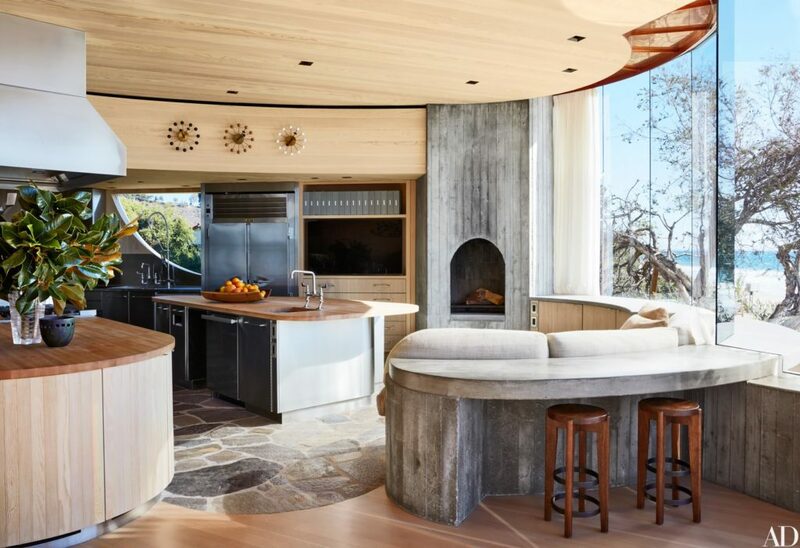 Swooping roofs and curved guardrail, materials such as wood, stone and copper and stunning views of the ocean are reoccuring elements in this futuristic, yet organic modern home design.